Superstorm Sandy debris is seen in the parking lot of Jacob Riis Park in the Rockaway section of Queens on Wednesday. NEW YORK -- Last summer it was packed with beachgoers, a parking lot where New Yorkers stashed their cars, applied sunscreen and dragged lawn chairs, coolers and umbrellas across the blacktop toward the shore. Today it's an enormous waste collection site half a mile long and a quarter-mile wide, piled high with debris from the flooding caused by Superstorm Sandy. Though the flow of debris has slowed a little, the cleanup job is far from over. New York City officials have determined that around 350 homes in the city are beyond salvation, including 80 in Breezy Point alone, said Fred Strickland, the resident engineer from the Army Corps of Engineers, which is helping the New York Department of Sanitation with the cleanup. If all goes according to plan, the city will condemn the houses and demolish them, and Strickland's team will help haul away the rubble. Twisted steel, waterlogged wood, broken furniture and countless mattresses already fill the parking lot that normally serves one of New York's most popular ocean beaches. Hundreds of trucks come and go around the clock bringing material collected from the streets of the Far Rockaways and Breezy Point, where water from Sandy's storm surge tore apart homes and buildings. Residents are still digging out. The temporary garbage dump at Jacob Riis Park in Queens is one of several sites around the city being used this way. The size of the dump reflects the enormity of the damage caused by the storm. The debris just keeps coming. "Our mission is to clear the right of way -- sidewalk to sidewalk," said Strickland. Strickland said his collectors are making constant rounds of the hardest-hit neighborhoods, going back for more debris as homeowners clean out flood-damaged homes. Strickland expects his assignment, paid for by the Federal Emergency Management Agency, to take four months. Residents of the Jersey Shore talk to Nightly News about surviving Hurricane Sandy as they search for pieces of their past amid the wreckage. NBC's Stephanie Gosk reports. "I'll probably get to see the ball drop in Times Square this year," said Strickland, who is from California. Strickland works out of a high-tech trailer parked on the edge of the dump. Inside are maps of the New York area, tasks and reminders scribbled onto whiteboards, and several computers. He says by Saturday he expects to have a thousand vehicles and roughly four thousand people working on the cleanup. Has Sandy left you in the lurch? 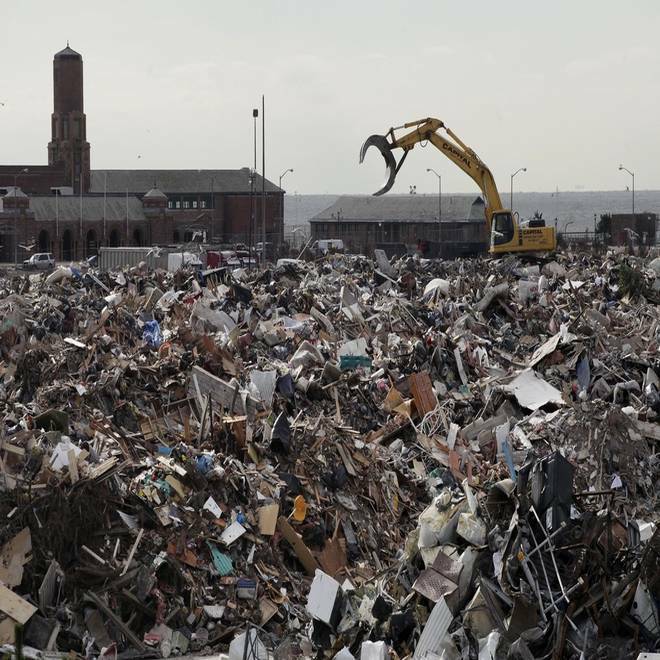 The debris hauled to the site by the Army Corps is being combed over by workers for the Environmental Protection Agency, then trucked over to Staten Island, put on a barge and floated up the Hudson river to a landfill near Albany. At the site, the EPA workers don full-body suits and gas masks and then scramble through the piles of debris to pick out hazardous materials like aerosol cans and electrical appliances. Other EPA workers test the air for a range of hazards including bacteria, viruses and fungal agents, hazardous fumes, and lead paint. Workers on the site are drawing on experiences from Hurricane Katrina and the devastating tornado that hit Joplin, Mo., over a year ago. The Army Corps said it has hauled 4,500 tons to Jacob Riis already; the sanitation department, which is also using the site, said it has cycled through ten times that amount. Surveillance video from the New York-New Jersey Port Authority shows water from Superstorm Sandy gushing into a subway station in hard-hit Hoboken, N.J. Instead of sending debris upstate via barge, the sanitation department has been moving it to landfills out of state, including one in Pennsylvania. Citywide, the department said it has collected a quarter of a million tons of debris. "It's historic, the amount of tonnage," said Joe Hickey, assistant sanitation chief at the department. He added that if the debris piles were to be lined up end to end they would stretch for two miles. Once the debris is gone, Hickey said the sanitation department will bring in street sweepers and other machines to scrub away the last traces of the dump. "When the Department of Sanitation gets done with this, if you didn't know already that this is used the way it's been used, you would never know," he said.